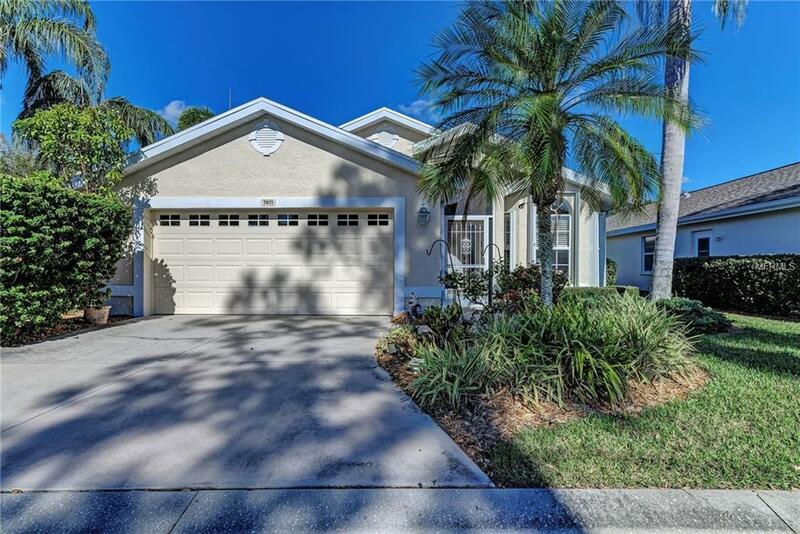 Immaculate home located in the fabulous and charming, maintenance free-yard community of Pinehurst Estates, a wonderful North Sarasota location within Palm Aire. This 3 bedroom split plan home features a very smart design and a wonderful use of space. The high and airy ceilings allow for streams of natural light to flow in and the neutral decor creates a welcoming space. Easy care laminate floors are located throughout the whole home except for the kitchen and baths which are nicely tiled. Preparing meals will be a breeze in the spacious and well planned eat in kitchen. Corian counters, tall wood cabinets with top molding, pendant lighting, tumbled travertine backsplash and a quality brushed nickel pull out faucet complete the package. The master bedroom is spacious and has a great walk in closet, sliders that lead out to the glassed in lanai which can be used as a den / office or study area. The roman walk in shower and large master bath should also be noted. Talk about location ! Just moments to the new Whole Foods, UTC mall, wonderful dining and shopping and the world famous sugar sand beach of Siesta Key. The community fees are remarkably low at $240 per month which include all yard care including shrubs, trees and mulch, exterior pest control, basic cable TV and use of the popular geo-thermal heated community pool. NEW roof in 2018 and easy close hurricane shutters make this a compelling offering. Palm Aire Country Club offers many optional plans, ask for details ! Additional Lease Restrictions Two Years Owner Occupancy Prior To Availability To Lease. Limited Amount Of Properties (5) Allowed To Be Leased At Any One Time. See Documents For Clarification.